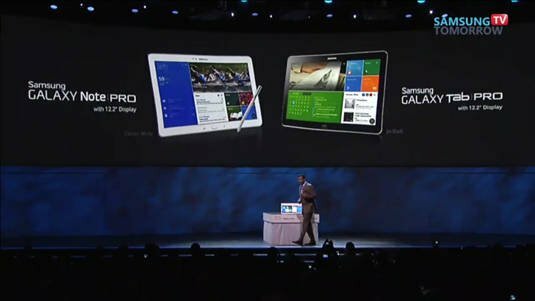 CES 2014 Samsung has taken aim at the professional end of the tablet market with a new line of "Pro" tablets – including two 12.2-inch models – and in doing so has thrown down the gauntlet to not only all other Android tablet manufacturers, but to Apple and Microsoft as well. "What we always hear consistently is that people want to do more with their tablets," Samsung Telecommunications America VP for tablets and emerging business Nanda Ramachandrar told a press conference at the Consumer Electronics Show (CES) in Las Vegas on Monday afternoon. And from Samsung's response to those requests, it appears that those customers want not only a larger display with which to work, but also interface, usability, and additional hardware enhancements. Ramachandrar emphasized that the two new big-screen tablets – the Galaxy Note Pro with stylus and Galaxy Tab Pro without – are not merely aimed at productivity-addicted corporate drones, but also white-collar folk who like to let their hair down when their workaday duties are completed. As he explained it, the new Pro fondleslabs are "premium tablets for both work and play." The displays on the new tablets have 2560-by-1600 WXQGA resolution – that's a hair under 4.1 million pixels. "A 12-inch display," Ramachandrar said, "is about the size of a normal piece of paper, so that when you're reading your morning news you don't have to pinch and zoom all the time." 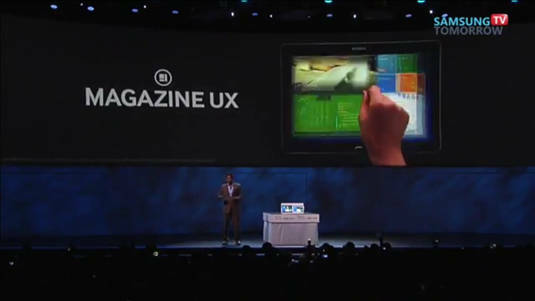 Samsung has replaced its TouchWiz interface with a new customizable UI it calls Magazine UX, which is the first thing you see when you unlock one of the tablets, and which has more than a little widgety whiff of Windows 8.1 about it. Magazine UX "funnels all your content and information onto three stylish screens" that appear on the home page, Ramachandrar said, and among which you can flip back and forth. 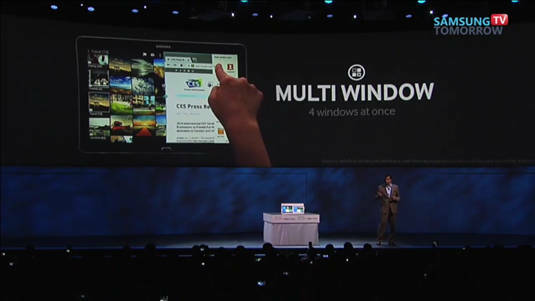 In addition to a larger virtual keyboard, another UI element that takes advantage of the increased display real estate is what Ramachandrar described as an "enhanced Multi Window feature," which allows you to view up to four different apps simultaneously, choosing them from a pop-out menu that appears when you swipe the tablet's bezel, and then dragging them into a tablet half or quadrant. The Pro tablets, he explained, have been optimized for Cisco's WebEx web conferencing service for remote conferencing – a six-month free trial is included. For non-remote conferencing, up to 40 of the devices can be joined in a collaborative editing mode when on the same Wi-Fi network using Samsung's E-Meeting tech. Samsung's Remote PC tech is also supported for access to your home or office PC. Speaking of Wi-Fi, the new Pro tablets support 802.11ac wireless, but with two enhancements. The first is a MIMO (multiple input, multiple output) system for multistream throughput enhancements, and the second is what Ramachandrar characterized as a "cool new feature:" Network Booster, which simultaneously combines Wi-Fi with a 3G or 4G connection to further speed up downloads. True multitasking means having multiple windows open simulataeously – how about four? Other components inside the Pro tablets include a 2.3GHz quad-core processor – either Samsung's own Exynos or a Qualcomm Snapdragon 800, we presume – plus 3GB of RAM and a 9500mAh battery that Ramachandrar claims will provide over 10 hours of battery life for watching video. The operating system is Samsung's version of Google Android 4.4, aka KitKat. The Note Pro, Ramachandrar ... well ... noted, is 7.95 millimeters thick – he of course said "thin" – and weighs 750 grams with the included S Pen stylus. By comparison, Apple's 9.7-inch iPad Air is 7.5mm thick and weighs between 469 and 478 grams, depending upon model, and the 10.6-inch Microsoft Surface 2 is 8.89mm thick and weighs 676 grams. Sammy's smaller tablets were not left out of the Pro party – there are 8.4-inch and 10.1-inch Tab Pro versions, as well, both also with 2560-by-1600 WXQGA resolution, 2.3GHz processors, and running KitKat. Both weigh less than 500 grams, Ramachandrar said, and provide 10 hours of battery life. As we've come to expect in Samsung tablets, each of the four charge through a micro USB port and accept a microSD card for additional storage. Ramachandrar didn't provide ship dates or pricing for the new Pro line, but other outlets are reporting that the tablets should begin to appear sometime this quarter, although price remains a mystery. We can only assume, however, that if the pricing is competitive with that of the noticeably smaller Apple iPad Air, Cupertino may have a serious challenger on its hands if the Magazine UX and the other enhancements start to woo the pro market. The Reg being a hotbed of discussion about climate change and its causes, effects, remediations, costs, and priorities, this reporter would be remiss if he didn't point out that during opening remarks that preceded the press-conference parade of new televisions, washing machines, refrigerators, ovens, cameras, and tablets, Samsung Electronics president and CEO BK Yoon outlined four major changes through which our world is now hurtling, and which he believes technology should address. After touching on accelerating connectivity, rapidly increasing urbanization, and the aging of world populations, Yoon introduced his fourth horseman: climate disruption. "New risks are emerging," he said. "I was shocked. 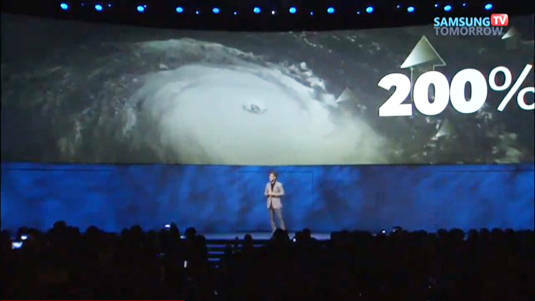 We all were shocked when we saw the reports of hurricanes devastating entire countries. Extreme weather events have increased by 200 per cent since 1990."